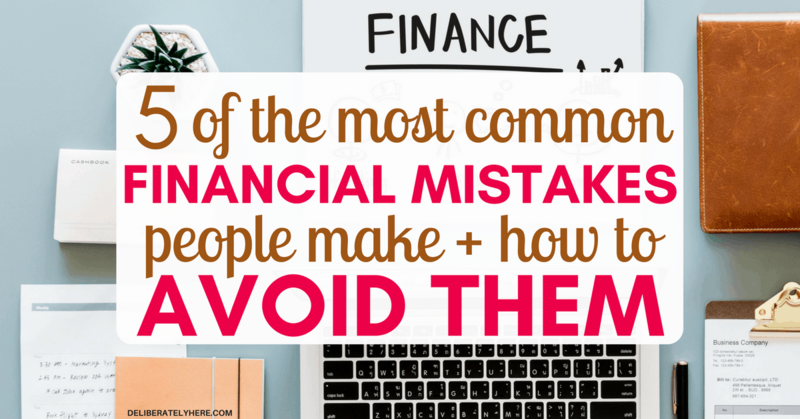 How do you correct or prevent common financial mistakes that seem bound to happen? By educating yourself and catching them early on, here we’ll learn how you can do this, and you’ll learn 5 of the most common financial mistakes people make. Finances, financial planning, financial mistakes. All those topics that you would sooner avoid than have to face. Financial planning? That sounds boring. Financial mistakes? We’ve all made them but we certainly don’t want to talk about them. Finances. I just wish I could have security in my finances. 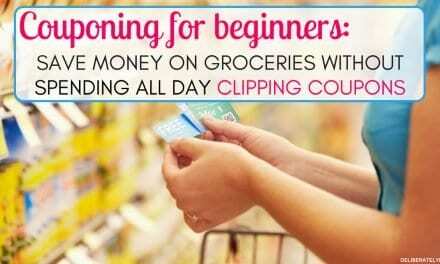 Do you struggle with proper planning and keeping track of your finances? I know a lot of people that do, so rest assured in knowing this: you’re not the only one who is struggling with their finances. Money and finances are both such big topics that everyone and their dog seem to have an opinion about. 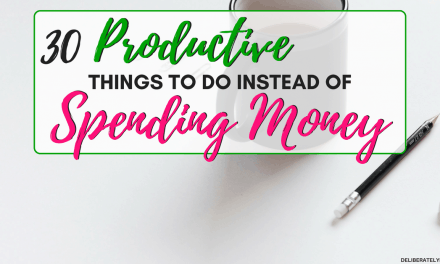 With endless financial advice out there about how you should be handling your money and the proper steps to take to gain financial freedom, a lot of people (myself included) seem to skip over a whole very important area of finances. 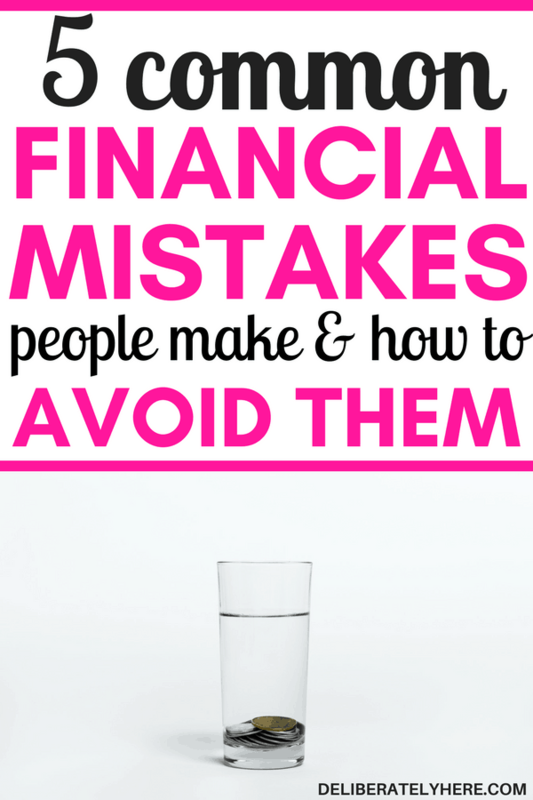 That is, common financial mistakes people make and how you can avoid making them. 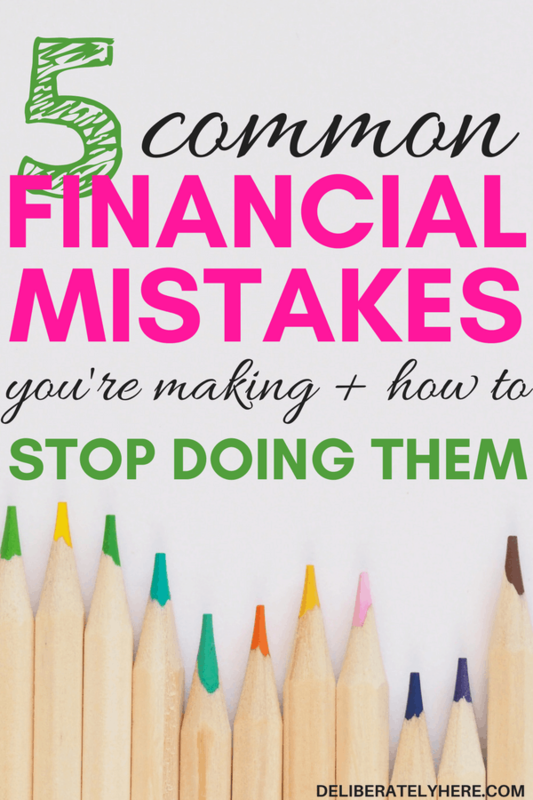 If you’re wondering why you should know what these common mistakes are rather than just focusing on being good with your money, the reason why you should know these common financial mistakes is so that you can ensure you’re not making them. Learn from other people’s mistakes so you don’t have to make the same mistakes they did. It’s shocking the number of people that completely let planning for retirement slip by. It is extremely easy to forget about retirement and just focus on where you are in the moment, or on a short-term plan. We need to remember that we will be retiring one day and ask ourselves what we are going to do financially when that happens. Will we be able to retire when we hope to, or will we have made the one big mistake of forgetting to plan for retirement and thus have to work well into our old age? How will your finances look when you hope to retire? Will you have racked up debt that requires you to keep working just to pay it off? Will you have been financially secure throughout your life but have completely forgotten about retirement and in a pinch realizing that you can’t afford to stop working? Or, will you have made smart financial decisions with your future retirement in mind throughout your life that is now allowing you to retire at a comfortable age? Discover your credit score for free at Credit Sesame – doesn’t require a credit card and doesn’t impact your current score. Spending more money than you make is a very common mistake that many people make without realizing it. Many people don’t have a budget, and if you don’t have a budget how are you supposed to keep track of how much money is coming in every month, and how much money is going out? If you are spending more than you’re making, even if it’s just a couple dollars more every month, eventually you will find yourself buried in debt and you won’t even realize how you got there. You may have never run out of money. Maybe you just spend a few pennies more than you made so it isn’t really noticeable – until one day this bad money mistake will catch up with you. That’s why it is SO important to have an updated budget every month. If you made a budget a year ago and are still basing your spending and saving off of that, it’s time to make a new one. As income and expenses change, so does your budget. Making a budget will allow you to see exactly how much money you’re making each month and it will give you the exact numbers of how much you can be spending on different monthly expenses. Don’t make the financial mistake of spending more money than you make, it will end up hurting you big time in the long run. Grab a free printable budget worksheet here. People that neglect and forget about their savings account are wasting money without even knowing it. Many people keep their money in a chequing account and don’t think anything of it. When really their money could be earning more money simply by moving it and letting it sit in a different account. 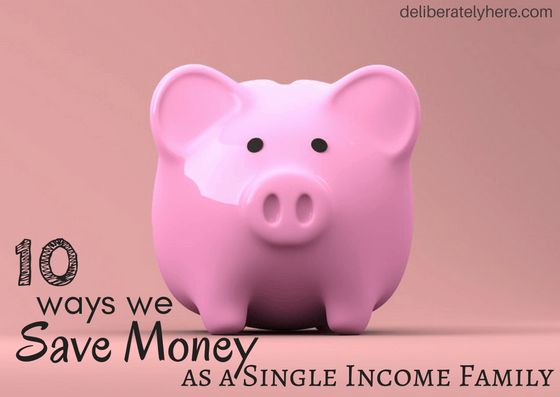 Don’t let your money waste itself – make your money work and earn more money without much effort from you. Rather than paying all your bills and spending your money every month THEN putting any leftovers into a savings account, make a habit out of putting money into your savings account first, then spending any leftovers. Having an emergency fund is something that everyone should have. I realize that it’s easy to think that an emergency will never happen to you or your family, but unfortunately, they can happen at any time, to anyone. Having an emergency fund of at least $1,000 (although it is recommended that you build your emergency fund up to the equivalent of 3 – 6 month’s wages) is vital. Since emergencies can happen at any time it is important to have some money saved up so that you don’t need to fall into debt and rely on credit cards to carry you if something happens that requires you to take time off of work. Don’t make the all-too-common mistake of not building an emergency fund, start building your emergency fund today by putting it into your budget and being consistent with it. If you have debt and you aren’t working on paying it off you are costing yourself a lot of money. People that let debt sit without paying it off are setting themselves up for bigger and bigger debt in the future. There are many different ways that you can avoid this problem and pay off your debt. Popular strategies to paying off debt include snowball your debt and debt avalanche, both of these options will help you work on paying off your debt so you aren’t paying more than you need to be. If you aren’t concerned about your debt, you should be. Depending on the interest rates, some debts will add up faster than others over time and you should definitely be finding ways to pay off your debt, whether that’s finding ways to make extra money every month to put towards paying off debt or living below your means so you can save more of your money. 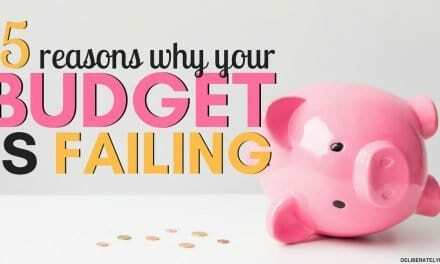 Catching these common mistakes early on, or avoiding them altogether, will help you adjust your financial habits and enable you to gain control of your finances. 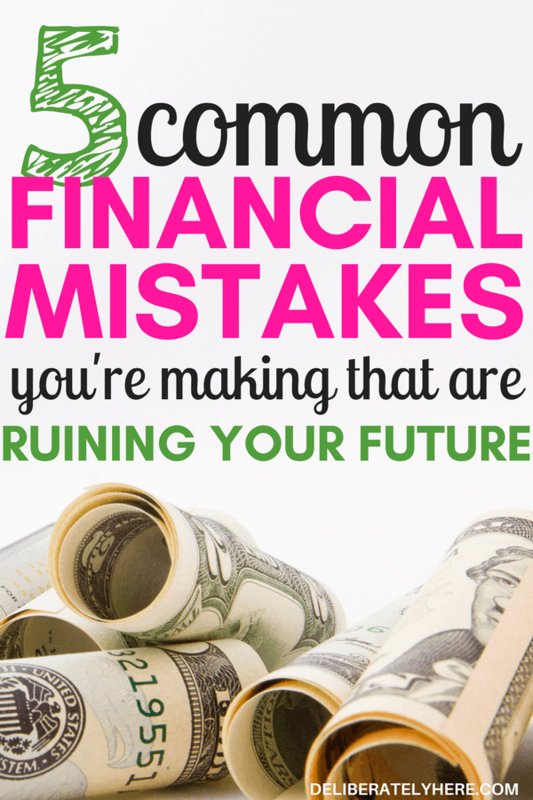 What are some financial mistakes you’ve made in the past that you wish you could have avoided?